•Too much of a good thing: eating, drinking and spending too much. An overabundance of parties and gift-giving may lead people to eat, drink and be merry – often to excess. Overindulging in rich foods, alcohol and spending can burden many people with the additional stress of dealing with consequences (weight gain, memories of embarrassing behavior and debt) that linger after the season is over. •Family fatigue: too much togetherness. The holidays are a time when families tend to gather. While this can be a wonderful thing, even the most close-knit families can overdose on togetherness, making it hard for family members to maintain a healthy balance between family-time and alone-time. •Not enough togetherness. For those who don’t have family, loneliness can be just as difficult. When everyone else seems to be getting together with family, those who rely more on friends for support can feel left out and alone. •SAD can make you sad. As daylight diminishes and the weather causes many of us to spend more time indoors, many people are affected to some degree by a type of depression known as seasonal affective disorder (SAD). It’s a subtle, but very real condition that can be a source of stress and unhappiness during a time when people expect to feel just the opposite. •Set your priorities. 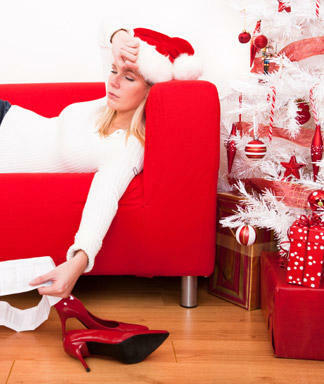 The flurry of baking, shopping, sending cards, visiting relatives and other activities can leave you exhausted by January. Pick a few favorite activities and really enjoy them. Skip the rest. •Cut corners. If you can’t imagine the idea of skipping all some of the activities that usually run you ragged, find ways to simplify. For example, only send cards to those you’re in regular contact with or don’t include a personal note in each one. •Watch your finances. Before you go shopping, plan a reasonable budget for holiday spending. Then, stick to your budget. King County’s Making Life Easier Program can help. The program offers financial consultation on issues such as budgeting and financial planning and 8 free counseling sessions with a licensed professional per problem per year. •Change your expectations for togetherness. Think back to previous years and try to pinpoint the amount of togetherness with family and friends you can handle before feeling stressed out. Then, look for ways to minimize the stress. Try limiting the number of parties you attend or the time you spend at each. Or, reduce the time you spend with family to an amount that will feel special without leaving you exhausted. •Nurture your heart. If holidays tend to make you feel lonely or depressed, make plans to meet with a friend, spiritual leader or counselor to get the support you need. If virtually everyone you know is with family during the holidays, consider volunteering to help others. Helping others can be rewarding and help fill the void you may be feeling. •Take care of yourself. Your holiday plans should include steps to take care of your physical and emotional health. Remember to get enough sleep and eat nutritiously. Also, be sure to exercise daily if possible. Exercise and exposure to daylight can help reduce or even eliminate the symptoms of SAD.